Huh. Jim Starlin's cult favorite comic Dreadstar, published back in the '80s under Marvel's creator-owned imprint Epic, is inexplicably — but happily! — coming to the big screen. We wen'te expecting this, but it's definitely good news. 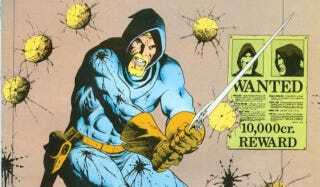 The series centered on the exploits of Vanth Dreadstar and his crew — powerful mystic Syzygy Darklock, the cybernetic telepath Willow, cat-like humanoid Oedi, and freebooter Skeevo. Vanth, newly arrived in the Empirical Galaxy after the events of Metamorphosis Odyssey, tries to live a pastoral existence on Oedi's planet of peaceful cat-people, but his peace is disturbed by the arrival of Darklock, who wants him to get involved in the conflict between the two major forces in the galaxy, the Monarchy and the theocratical Instrumentality. Imagine Star Wars and Heavy Metal magazine meeting in the PG-13 middle, and that's pretty much Dreadstar. The movie will be produced by Illuminati and Benderspink, the latter of which's co-owner, J.C. Spink, said, "Apart from Star Wars, this was my favorite science fiction story growing up."